In the 2016 presidential race, registered voters remain skeptical about how each of the candidates would fare as president. 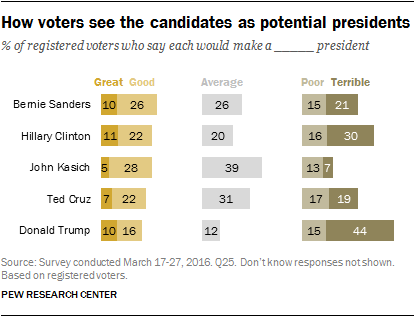 No more than 36% say any of the remaining five candidates would be a good or great president, and in the case of three of the candidates (Hillary Clinton, Ted Cruz and Donald Trump), more voters say each would be a “poor” or “terrible” president than say they would be “good” or “great.” Only John Kasich is seen by more as a potentially good or great president (33%) than as a poor or terrible one (19%), with the plurality of voters (39%) saying that Kasich would make an “average” president. About a quarter of voters (26%) say that Trump would be a good or great president, while nearly six-in-ten (59%) say he would make a poor or terrible president. Just 12% say Trump would be an average president, far fewer than say this about any of the other candidates. While about as many say Cruz would be a good or great president as say this about Trump (29%), far fewer (36%) say he would make a poor or terrible one; 31% say a Cruz presidency would be average. 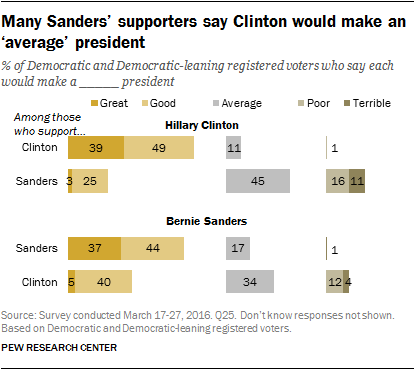 Of the Democratic candidates, Clinton is somewhat more polarizing than Sanders: One-third of voters (33%) say she would be a great or good president, while 46% say she would make a poor or terrible president. Just 20% say Clinton would be an average president. Although about as many voters (36%) view Bernie Sanders’ potential presidency as good or great as say this about a potential Clinton presidency, fewer voters offer negative evaluations of a possible Sanders presidency (35%), while somewhat more (26%) say he would be average. The share of voters saying a Kasich presidency would be good or great has grown from just 13% in January to 33% today, and somewhat fewer now say he would make a poor or terrible president (19% today, 24% then). In January, nearly a third of voters (31%) did not offer an opinion about a possible Kasich presidency; today 9% do not. Although overall views of most other candidates as possible presidents are little changed over the last few months, the share of voters who say Trump would be a poor or terrible president is up seven points (from 52% to 59%). About half of Republican and Republican-leaning registered voters say Trump (49%) would make a good (29%) or great (21%) president, while 30% say he would be poor (12%) or terrible (19%). The share of GOP voters saying Trump would be a good or great president has declined seven points since January (from 56%), while the share saying he would be poor or terrible has increased eight points. Though this change is seen across most Republican groups, the rising share saying he would be poor or terrible is somewhat more pronounced among Republican women than men. Today, 38% of GOP women say he would be a poor or terrible president, up from 24% in January (by comparison, just 24% of Republican men say Trump would be poor or terrible, little changed from 20% in January). The possibility of a Cruz presidency is also viewed positively by about half of Republican voters (48%); 33% say Cruz would be an average president, while only 17% say he would be a poor or terrible one. These views are slightly less positive than they were in January (when 53% said he would be good or great and 13% said he would be poor or terrible). About four-in-ten Republican voters (38%) now say Kasich would make a good or great president, while roughly as many say he would be an average one (37%); 18% say he would be poor or terrible. Although fewer GOP voters rate a potential Kasich presidency as good or great than say this of Trump or Cruz, evaluations of Kasich as a possible president have grown significantly more positive over the course of the last two months. Today 38% of GOP voters say Kasich would be a good or great president, up from 17% in January, and just 18% say he would be poor or terrible (25% in January). Among Democratic voters overall, Clinton and Sanders are viewed similarly. Roughly six-in-ten say Clinton (57%) and Sanders (59%) would make good or great presidents, while nearly three-in-ten say they would be average presidents. The share of Democratic voters saying Clinton would make a good or great president is down seven points since January (64% then, 57% today), while views of Sanders’ potential presidency as good or great have increased by a similar share (51% then, 59% today). 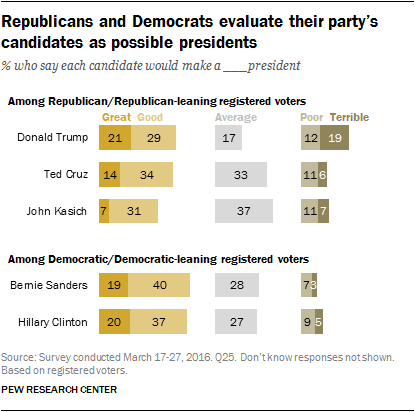 As was the case in January, few today say either Clinton (14%) or Sanders (10%) would be poor or terrible presidents. Democratic voters remain intensely negative in their evaluations about a potential Trump presidency. Fully 84% say he would make a poor or terrible president—including 67% who believe he would be terrible. Just 7% say Trump would be average, while 6% say he would be good or great. Though Democratic views of the other GOP candidates are not particularly positive, they are considerably less negative. Cruz, for instance, is expected to be a poor or terrible president by about half of Democratic voters (52%), while only 14% say he would be good or great (29% say he would be average). And Democratic voters view a Kasich presidency more positively than negatively: 42% say Kasich would be an average president, 29% say he would be good or great, while just 20% say he would be poor or terrible. Among Republican voters, a possible Clinton presidency is viewed more negatively than a Sanders presidency. Still, both are viewed as poor or terrible potential presidents by the majority of Republicans (81% say this of Clinton, 64% of Sanders). More than eight-in-ten supporters of each of the three GOP candidates say their candidate will make a good or great president, but they are far less positive in their assessments of the other two men in the field. Across the board, fewer than a third of any Republican candidate’s supporters say either of the other candidates would be good or great presidents. But Trump stands out for his relatively poor performance among Cruz and Kasich supporters. Fully 50% of Cruz supporters say Trump would be a poor (22%) or terrible (28%) president. 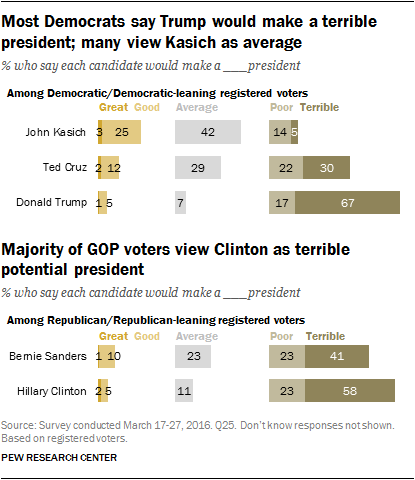 Kasich supporters are similarly negative about Trump: 55% say he would make a poor (19%) or terrible (36%) president. By contrast, only 25% of Kasich supporters say Cruz would be a poor or terrible president, while just 17% of Cruz supporters say this about Kasich. And roughly a quarter of Trump supporters say Cruz (25%) and Kasich (26%) would be poor or terrible presidents. More than eight-in ten supporters of Clinton (88%) and Sanders (82%) say their candidate would make a good or great president. But views about their intraparty opponent are not as overwhelmingly positive. Sanders supporters, in particular, have mixed views of a potential Clinton presidency: A 45% plurality say she would be an average president, while about as many say she would be a good or great president (27%) as say she would be a poor or terrible one (28%). By comparison, a 45% plurality of Clinton supporters say Sanders would be a good or great president, while about a third (34%) say he would be an average one. Just 16% of Clinton supporters say Sanders would be a poor or terrible president. Overall, Donald Trump is supported by 41% of Republican and Republican-leaning registered voters; 32% favor Ted Cruz and 20% support John Kasich. Trump performs better among Republican men than women. While significantly more Republican men back Trump (45%) than support either of the other GOP candidates (30% Cruz, 19% Kasich), the proportion of women who prefer Trump is little different than the share who back Cruz (38% Trump, 34% Cruz). There are only modest age differences in GOP candidate support, with older people slightly more likely than younger people to back Trump. But there are substantial educational, income and religious differences. Trump garners more support from those with lower levels of education and income: Nearly half of Republican voters who have not attended college (48%) and 44% of those with some college education but no degree support Trump, compared with only about a third of those with bachelors (32%) or postgraduate (30%) degrees. Conversely, Kasich performs better among more highly educated Republicans: Fully 41% of those with postgraduate degrees back Kasich for the nomination, compared with just 11% of those who did not attend college. Support for Cruz varies little by education. Among white evangelical Protestant Republican voters, support is roughly divided between Trump (38%) and Cruz (41%), while a clear majority (57%) among the smaller share of the GOP electorate that is religiously unaffiliated supports Trump. Republican voters who regularly attend religious services are more likely to back Cruz (44%) than either Trump (29%) or Kasich (20%), while Trump leads among less frequent attenders. Roughly equal shares of self-described conservative Republican voters (43%) and moderate and liberal Republican voters (38%) support Trump. Cruz performs better among conservative Republicans than among moderates and liberals (37% vs. 23%). And a greater share of moderate and liberal Republican voters than conservative Republican voters support Kasich (30% vs. 15%). Hillary Clinton is supported by 49% of Democratic and Democratic-leaning registered voters, while Bernie Sanders is backed by 43%. There are substantial age and gender differences in support for the two Democratic candidates. Democratic voters under 30 prefer Sanders by more than three-to-one (74% Sanders, 21% Clinton), while those 30-49 are more divided (43% Clinton, 48% Sanders), and Democratic voters 50 and older back Clinton by substantial margins (she leads among those 50-64 by 35 points and by 58 points among those 65 and older). Democratic women back Clinton by a 13-point margin (52% vs. 39%), while Democratic men are more divided in their preferences (46% Clinton, 48% Sanders). But gender differences are particularly pronounced among younger people: There is a 16-point gap among those under 50 in support for Sanders between Democratic men and Democratic women (68% vs. 52%). By comparison, there is no gender gap among Democratic voters ages 50 and older (69% of men and 67% of women back Clinton). Black Democratic voters are more likely than whites to support Clinton (58% vs. 47%). Clinton also performs better among Democrats who regularly attend religious services (58% vs. 45% among those who attend less frequently), and among self-identified conservatives and moderates (55% vs. 44% among those who identify as liberal). Would Trump and Clinton unite their parties? 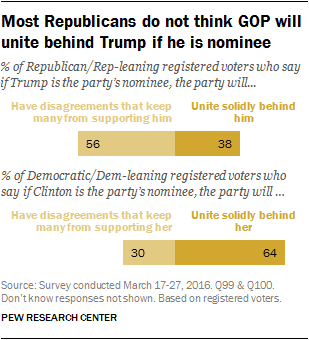 A 56% majority of Republican registered voters expect that disagreements within the GOP will keep many Republicans from supporting Donald Trump if he becomes the party’s nominee; just 38% say the party will unite solidly behind him. By contrast, 64% of Democratic voters say the Democratic Party will unite solidly behind Hillary Clinton if she becomes the party’s nominee, while just 30% expect that disagreements within the party will keep many from supporting her. In March 2008, similar majorities of Democrats said the party would unite behind Barack Obama (66%) if he became the nominee or Clinton herself if she became the nominee (64%). But the share of Republican and Republican-leaning registered voters who say the Republican Party will unite solidly behind Trump (38%) is far lower than for other GOP frontrunners in elections dating back to 1996. In both 2008 and 2012, clear majorities of Republican voters expected the GOP would unite behind John McCain and Mitt Romney, respectively. 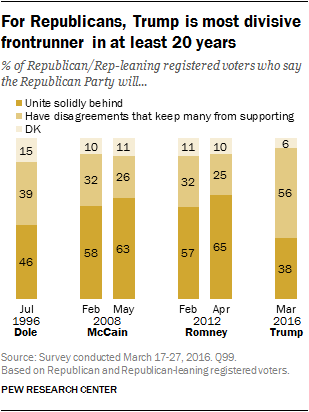 And in 1996, about as many said the party would unite behind Bob Dole as said disagreements would keep many from supporting him (46% vs. 39%). 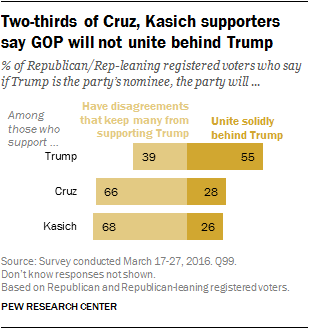 Among Republicans, about two-thirds of those who support Ted Cruz (66%) and John Kasich (68%) say the disagreements within the GOP would keep many Republicans from uniting behind Trump if he were to become the nominee, while roughly a quarter of each say the party would unite behind Trump. More than half of Trump supporters (55%) expect Republicans to unite behind him, while 39% say they expect divisions to prevent many from supporting their candidate. 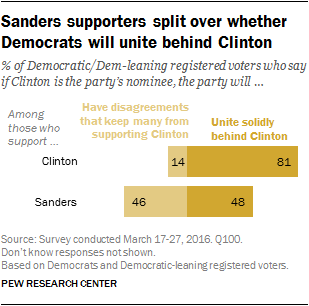 Though Democrats overall are more optimistic about the party’s ability to unite behind Clinton if she becomes the nominee, Sanders supporters are divided on this question: About half (48%) say the party will come together to support Clinton, while about as many say disagreements within the party will keep many from supporting her (46%). By an overwhelming margin, most Clinton supporters say that the party will unify behind her (81% say this).